Now there are varies types of security inspection system that used to check the package and also the human’s body, and if you often take the transportation tools you can often see the handheld metal detector and also the X-ray security inspection system are used in such condition, but have you ever seen the X-ray security inspection system used to check the hand baggage, here this FISCAN CMEX-B6140 Multi-energy X-ray Security Inspection System just owns the ability. This FISCAN CMEX-B6140 security inspection system is the multi-energy X-ray security inspection system equipment. And because of having applied the advanced state-of-the-art X-ray imaging technology, this FISCAN CMEX-B6140 security inspection system can provide high resolution and ultra-clear images for easy object identification with the latest technology of computer control and image processing. 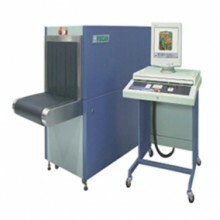 And application areas of this FISCAN CMEX-B6140 X-ray security inspection system is also widely for places such as the airport, customs, railway stations, government buildings, post office, convention centers, as well as schools this excellent hand baggage security inspection system can be used. More details of this FISCAN CMEX-B6140 X-ray inspection system is just here and you can take a glance at the specifications here. Works perfectly in Australia. Thank you for this nice Item. Was my first order! Appreciate your good service during the whole purchasing process and setting up instruction. Efficiect working system easy to install. I agree that this is a great security system for the price.